Nearly every inch of the earth’s surface has been surveyed by satellites and millions of miles of US streets have been mapped by specially equipped cars. In tough to get to places, bikes are used to get the job done. But what about the ocean? In some areas, the maps used for navigation on the ocean, called nautical charts, still show information acquired in the 1800s, so there is a LOT of work to do! How do we update nautical charts? NOAA uses ships and planes to map the ocean floor. What about hard to reach shallow areas, docks or piers? 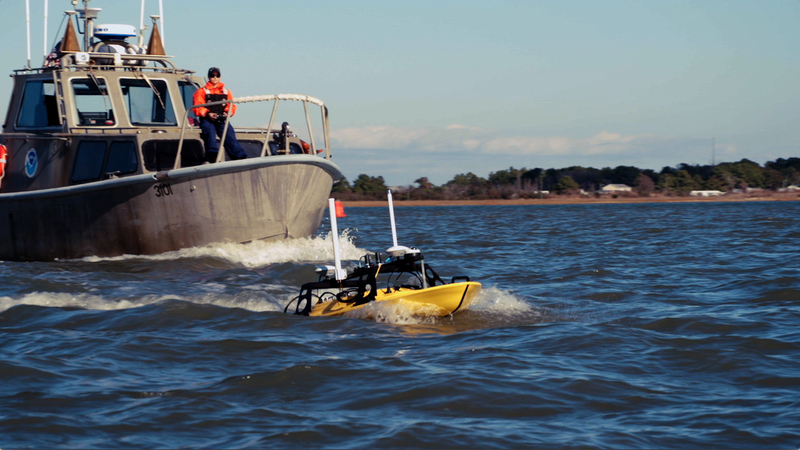 Like the bikes used to map where cars can’t go, remote control boats can be used in these tough-to-navigate areas. They’re autonomous surface vehicles, or ASVs, and they’re used by governments, universities, and even private citizens for all sorts of purposes. They can be remotely operated by a small crew or can be programmed to run automatically for hours and days at a time. NOAA is using this ASV to map a very popular inlet where boaters have found that nautical charts aren’t always 100% up to date. Storms can shift sand bars and deep areas can become shallow. Autonomous surface vehicles are highly maneuverable, meaning they can get much closer to piers, pilings, and the shoreline than a full-sized launch. Knowing the depth in inlets and shallow waters can help prevent grounding of vessels, as well more accurate predictions of coastal inundation during storms.